Multi-Axis Communications Just Got Simpler! Combitronic™ is a protocol developed by Moog Animatics that operates over a standard “CAN” (Controller Area Network) interface to simplify multi-axis communications. It may coexist with either CANopen or DeviceNet protocols at the same time. Unlike these common protocols, it requires no single dedicated master to operate. Each SmartMotor™ connected to the same network communicates on an equal footing, sharing all information, and therefore, sharing all processing resources. Through Combitronic technology, an array of SmartMotor servos become one giant parallel-processing system. This powerful technological advancement provides the joint benefits of centralized and distributed control. As shown in the video, Combitronic technology simplifies multi-axis communications by allowing any motor’s program to read from, write to, or control any other motor simply by tagging a local variable or command with the other motor’s CAN address. You can get the benefits of Combitronic technology for your multi-axis motion control applications. 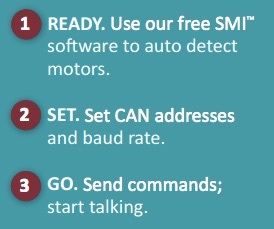 Register today to find out more about this simple yet powerful communication protocol available only on the SmartMotor! I want to learn more about Combitronic technology and how it can simplify my multi-axis applications.